QUEUES are building up after an accident on the westbound A27 carriageway near Fontwell. Early reports this morning (May 21) are that one lane is closed just to the west of Fontwell Park Racecourse. Details of any injuries are still unknown. 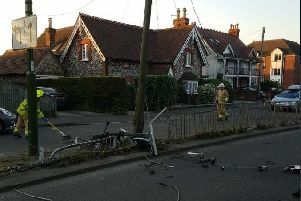 Police are at the scene but West Sussex Fire and Rescue Service confirmed it had not been called to the scene, meaning no one is likely to be trapped in the vehicles.